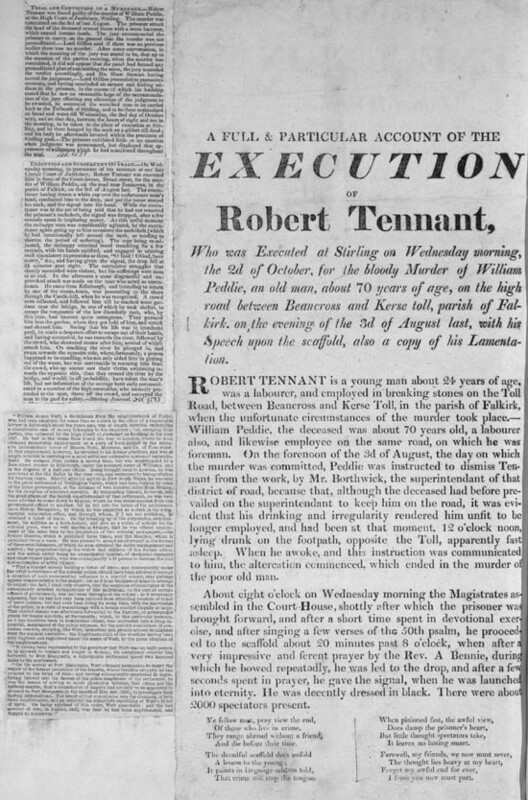 Broadsides were often used as a forum for moral instruction, and since this murder resulted from Tennant's drink habit, the broadside does go on to exhort the evils of alcohol. It does, however, include a lamentation, supposedly Tennant's last words, which is a common feature on broadsides. It was an opportunity to tug at the audience's heart and ask them to look at their own behaviour. There are other reports of this case held in the National Library of Scotland's collection. Reports recounting dark and salacious deeds were popular with the public, and, like today's sensationalist tabloids, sold in large numbers. Crimes could generate sequences of sheets covering descriptive accounts, court proceedings, last words, lamentations and executions as they occurred. As competition was fierce, immediacy was paramount, and these occasions provided an opportunity for printers and patterers to maximise sales.